The National Testing Agency has released the JEE Main 2019 result of Paper 1 on January 18, 2019. Since the results were published, candidates might be eager to know their ranks. The Board had released only the percentile and not the rank. The JEE Main ranks will be declared after the completion of JEE Main Paper 2 examination which is conducted in April. Based on the NTA Percentile score, candidates can check their ranks using JEE Main Rank Predictor. Here in this blog, candidates can check or calculate their ranks using their NTA percentile. We have given a formula to calculate your JEE Main 2019 rank. You can even check your rank directly using the JEE Main Rank Predictor tool. The percentile score given by the NTA is the relative performance of the candidate in regards to the other candidates. It is determined individually for separate subjects along with overall subjects. Candidates can calculate their percentile score by converting the scores into a scale between 100 and 0. This means that the percentile score is normalized score and not the raw score obtained by the candidates. Or you can also check your rank using JEE Main Rank Predictor tool. This will be an estimated rank of JEE Main Score based on the percentile you have entered. Enter your JEE Main 2019 percentile and click on Get Expected Rank. 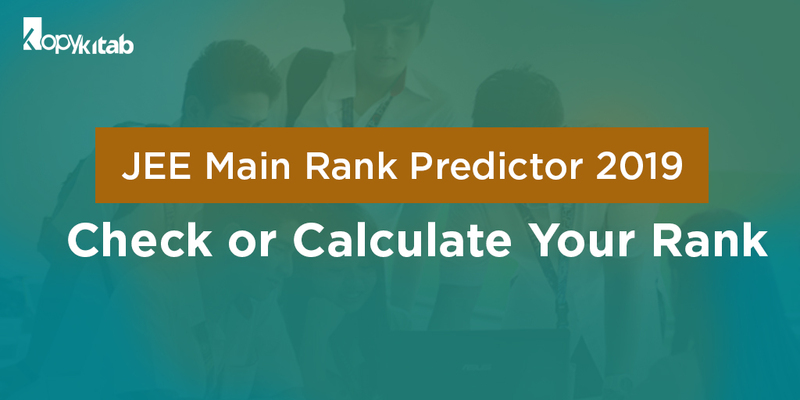 You will be able to see your approximate JEE Main 2019 rank through JEE Main Rank Predictor tool. You might be wondering about range of ranks for marks you have earned in JEE Main 2019 Exam. Below is the table consisting of minimum and maximum rank for JEE Main marks earned. You can just get an approximate range of the rank for your JEE Main 2019 score. The minimum expected NTA percentile is 89.5 that is required to be qualified for JEE Advanced. Candidates can start their preparation for JEE Advance with a wide range of JEE Preparation books available at Kopykitab. There are books from various publication available. We also offer previous year question papers for your preparation and also you can take up free mock tests to check your ability. Part-I for GATE 2016 : How to prepare for Engineering Mathematics ?